Because I got nothin', otherwise. It's been relatively quiet around here - critters are all doing well, we're doing well, school is, well, school...so, you get photos! Yarn is Somoko by Fleece Artist in the Forest Faire color-way. Pattern is Feather and Fan (or Old Shale - same thing. :lol:) This was a nice knit - too bad the yarn is discontinued. SG has requested a pair in the same color way, so I have the site bookmarked. 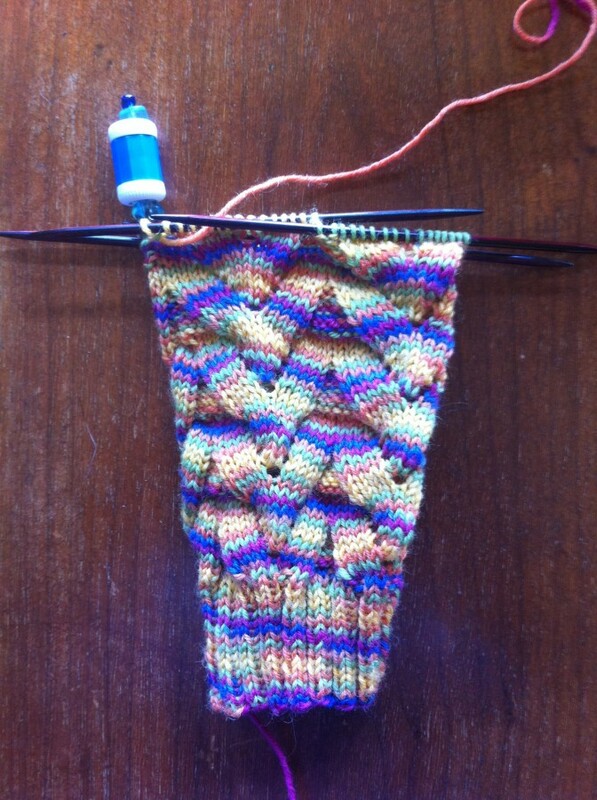 Easy pattern, and pretty fast to knit - the repeat is 4 rounds, so you find yourself wanting to see what happens with the next row.....I'm easily amused. Hanukkah prezzie for Herself; yarn is JL Yarn's Salvia. 100% Merino. Color 25 - the LOUDEST color way I had. She LOVES the colors; I'm finding them blinding when I knit outside. (My cell phone toned the colors WAY down. Think.....lemon yellow, neon lime green, screaming pink, royal blue, and orange. BRIGHT.) The pattern is Monkey by Cookie A - I love this pattern, because it makes good use of hand-paints that would otherwise pool and look odd. It's also easy to memorize - after the first repeat you go on auto-pilot and have no problems. Next up is a hat for Himself - he gets to pick the colors/pattern. I'm hoping for something patterned, but knowing him it'll be *boring*. Still - it's his hat. 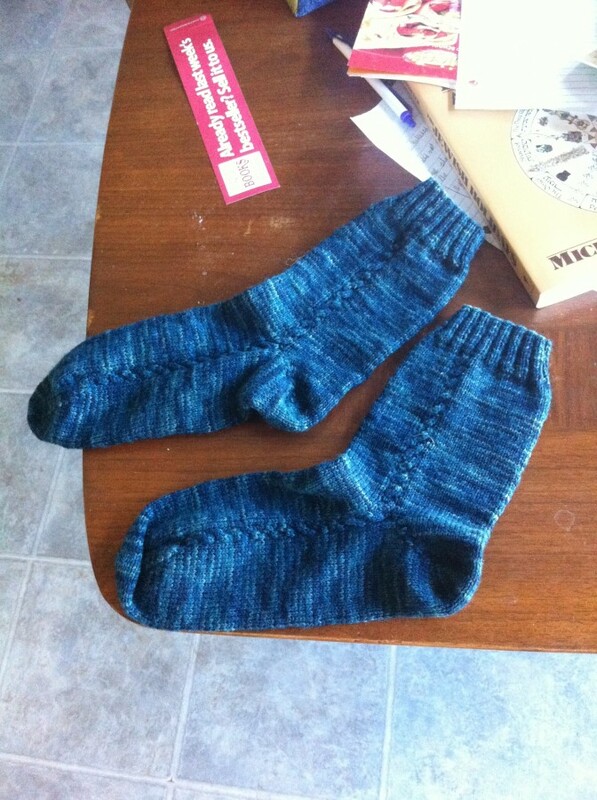 :lol: I want to do socks, but a) he has BIG feet and b) he prefers BORING socks. I'd go nuts.....I think he'll get socks off of the sock machine. 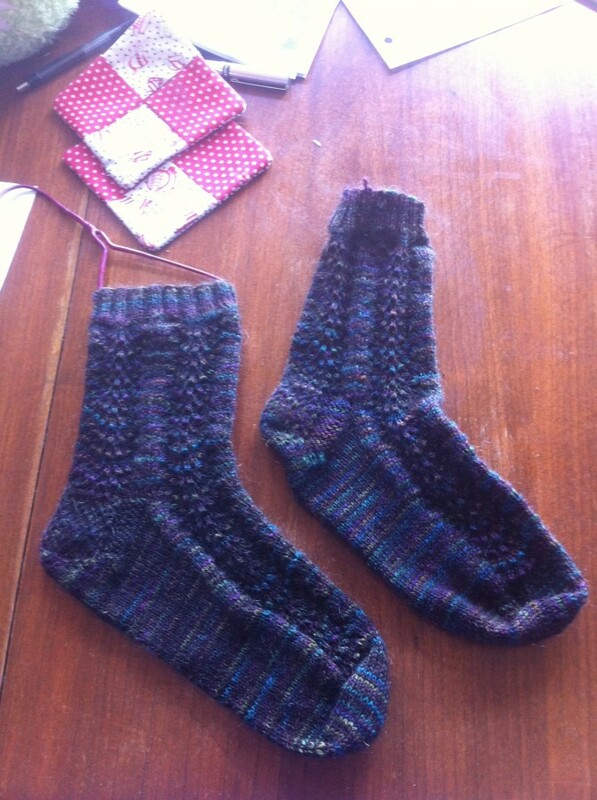 I can whip out a pair of plain socks in an hour or so, and I won't go bonkers with the mindless, boring, plain knitting. :sigh: I need to work on him......but I tease. Plain socks are fine.....just...I prefer knitting patterned ones. Gotta skitter - it's almost time to start school. And I have more knitting to do! This entry was originally posted at http://fiberaddict.dreamwidth.org/769631.html. Please comment there using OpenID.